Why is SEO Important For Dentists Offices? When was the last time you went online and Googled your practice? 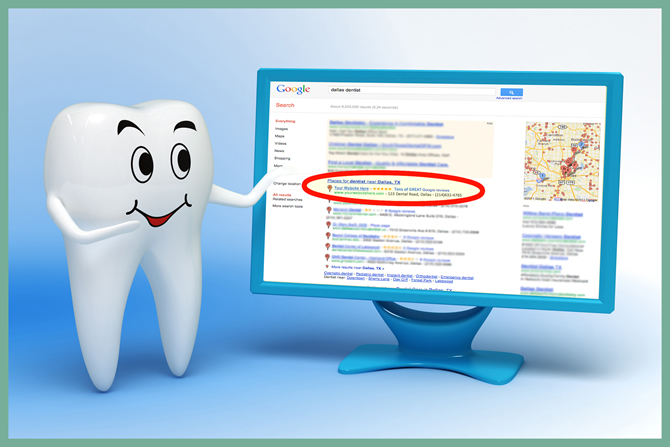 Or even just typed in your area and “dentist office” to see where your practice ranks in the search results? Most local dentists’ offices do not give much thought to search engine optimization, believing, perhaps falsely, that everyone needs to see a dentist eventually, and that when they do, they will be able to find your practice online, simply because there is not very much competition in your area. The truth is, however, that even if you are the only dental practice in your town, if you are not readily visible in search results, many potential patients will search for a dentist in the next town over, believing there are none in their own community. Because as valuable as word of mouth marketing is, there will always be newcomers or consumers who are just “out of the loop,” who will never have heard about your practice from their friends or family. Especially if your practice is brand new to the area, not being visible in local search can mean that most of your potential patients will seek out another office. Very few people use the yellow pages for anything other than a booster seat for their children anymore. A full-page ad in your local directory just isn’t as effective as is used to be. Likewise, advertising in the local paper is rarely the best way to get the word out. Dental SEO is the best way to make your office findable in today’s online consumer atmosphere. Dental Search engine optimization is a process of onsite changes and offline link building to your website that makes your website more visible in search results. One of the tenants of SEO is high-quality, keyword-rich content. Ten years ago, it was enough just to have your keyword repeated a few times in the content. Today, you actually have to have those keywords surrounded by valuable, relevant content, or search engines like Google will actually downgrade your rating. With local businesses like dentists’ offices, SEO also includes a number of offsite optimizations, like taking control of your listings in local online directories and managing online reviews. Not only do these directories and review sites give potential patients more places to find you, they also create high-quality links backs to your website that can help generate traffic and actually lift your website’s ranking. If you already have a functional website, you might believe that this is all you need in order to be found online. However, the truth is that if you are not implementing a functional search engine optimization strategy, you will probably miss out on at least 50% of your potential patients. Because more than half of your website’s traffic is likely going to come from organic search results, or at least it should be. And 90% of searchers will not click beyond the third page of Google, even if they have not found what they are looking for. This means that even if you have a website, if it is not on the third, second, or (most favorably), the first page of Google search results, you might as well not exist online. Only search engine optimization can boost your rankings. 1. Creating an atmosphere of trust and legitimacy. A dentists’ office that a potential patient finds on the third or fourth page of the search results may, in their minds, look like the an office someone set up in their garage. Internet users today have been trained to believe that businesses on the first and (sometimes) the second pages of the results are usually legitimate, while businesses beyond these pages are less legitimate. They know that Google puts the most valuable and the most trusted sites on the first pages and saves everything else, the dregs, for the rest of the pages. Having a higher search ranking can make your office look as legitimate as it actually is. 2. The higher you are ranked, the more traffic you will get. And the more traffic you get, the more patients you will have. How highly you are ranked in search results and what ratio of site visitors convert into patients may not have a direct correlation, but you have a much better chance of attracting the attention of searchers if you are highly ranked. This means that even if your website has a relatively low conversion rate, you will still have a higher number of new patients than if you had a much lower rank in the search results. 3. SEO effort usually improve the quality of your website. Search engine optimization demands high quality content and features be present on your webpage. When implementing a dental SEO strategy, your content will need to be rewritten and improved so that it provides real value to site visitors. You may even want to include features like a patient portal or the ability to schedule appointments right on the webpage. Features like these can make your website much more valuable in the eyes of your visitors, which makes it more valuable in a search engine’s eyes, too. These sorts of changes can improve your search engine ranking, but they also improve how useful and welcoming your website is for humans, too. Don’t fall into the trap of believing that you can rely on word of mouth or print advertising. Having a great search engine ranking will be much more valuable than just about any other marketing method, which means you need a great dental SEO strategy.